At Two Meows, we chose to build a bright green litter box as our very first product. We asked what do cat loving meow owners’ need that will compliment our kitty litter box? A super cool cat litter mat, of course! Being cat lovers our whole life, we know that no one likes the job of cleaning up the flying cat litter mess that happens. Our litter box does a wonderful job at keeping litter in but from time to time kitty litter does fly out and all over your floor if you don’t own a cat litter mat. Some of our kitties dig and go to town in their box so why not make the messy job a bit easier? 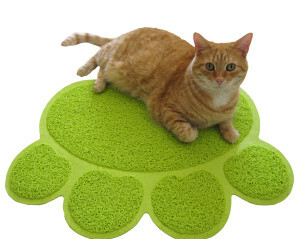 We desired a mat that appeared to look fun so we chose the big paw shape in a matching bright green color. We offer other colors too in the paw shaped cat litter mat. You will find Brown, Blue, Red and Grey in addition to the Bright Green. We are considering retiring some of the colors that have been around for quite some time with our company. A day in the life of Felix, one of Two Meows founding cats. Our ultimate paw shaped kitty litter mat is a larger size so that it keeps the excess litter in the litter box area not all over your house. The soft rubbery material gently brushes your cat’s paws to aid in keeping the litter on the mat and out of your feline’s paws. It effectively traps the flying litter right there. The Two Meows paw shaped mat is easy to pick up and gently shake excess litter back into the box. The mat has a special weave and loops to help enhance the feel on your paws or your 4 legged feline friend’s paws. We do not have any sharp or pointy edges on this mat. Just don’t stick your Two Meows mat in a dishwasher or washing machine. The paw mat is extremely durable but not enough to survive a dishwasher. Even with the soft rubbery brand new material, it does not come with a weird rubbery odor. Believe it or not, this mat does not absorb cat pee. Yes, we said it! We are not sure we know anyone who hasn’t had a cat pee outside of the box. Mistake or not, it happens. Think about how many times you have owned mats to control cat litter that are soft fabric, carpet remnants or fabric and rubber backed. All of those mats may be cute or funny or decorative but they have one thing in common. Mats with absorbent material will absorb cat pee. Yes, you can purchase ‘throw away’ mats and just keep repeating the same process of spending money and throwing them out. That’s not as exciting and fast as washing the paw shape off and putting it back to good use right away. It doesn’t really even need to dry. Well, maybe some extra drips need to dry if you super soak wash it. You may hand wash or easily hose wash and rinse the mat too when you need an extra deep cleaning treatment for your mat or for when your furry feline friend decides to pee over the side of the box. You will not need to buy a special soap to clean your mat. A little extra gentle scrub may be needed if your cat or cats have dumped more than just a spot of extra kitty whiz over the edge. Don’t be afraid to scrub it as we know this can happen. We have made this cat mat very simple and fun at the same time. What is not to love about it? We have discovered some loyal clients like the mat so much they purchased another one to wipe off their human paws when they come into their home. The Two Meows mat is not just for cat owners but dog owners too. The mat can also be on duty underneath your cat’s food and water bowl area. Everywhere a plain, old boring mat goes, this mat can go. We have heard that some meows have chosen to lay on the paw shaped mats and even play around them. The average cat household adopts the mat fairly quickly. There is no perfect placement of a litter mat. Two Meows recommends placing the mat up against the side of the box as close as possible without putting it under the box. You can certainly put the mat under the box but then it may not catch your cat’s paws for excess litter. You may want to consider buying more than one to cover all of your bases. Owning the Two Meows Paw Shaped Cat Litter makes that not so much fun job of cleaning the litter box a little bit easier. Easy and nothing complicated about it. Right now, Two Meows family brand of cat products is only sold online. You won’t find it down the street at a local retail store like PetCo or PetSmart or big box mart. Maybe some day soon you will find it at a retail store but not yet. Authentic Two Meows Paw Shaped Cat litter mats are not sold on eBay either by Two Meows. If you’ve seen it offered on eBay or another similar site, you may be encountering a counterfeit or fake Two Meows mat. In some of our pictures online, you will see a very special orange and white cat named Rascal. Rascal is one of the founding cats of Two Meows. He passed away in January 2015 after a very long battle with kidney disease. He was 17. The other founding cat owner is Felix. Felix is named by Greg and after a James Bond movie character. Felix is a shorthaired orange tiger cat. The newest one you can see in pictures is Teddy. Teddy joined the Two Meows family in February 2015. Teddy is younger and plays a little rougher than Felix prefers but they have also become wonderful bird watching brothers. We couldn’t wait to give Felix a new brother. Everyday Teddy and Felix step on a green paw shaped litter mat in their cat box palace. The pictures you see are our very own Two Meows family cats. They didn’t exactly raise their paw for the picture taking paw mat photo shoot but they do love their paw mats.